If you love seeing Maine food on TV as much as I do, you’ll want to check out State Plate. Maine is featured in one of the first episodes and Maine food producers are highlighted on the show. Read below for details and check out http://www.StatePlateTV.com for more information. 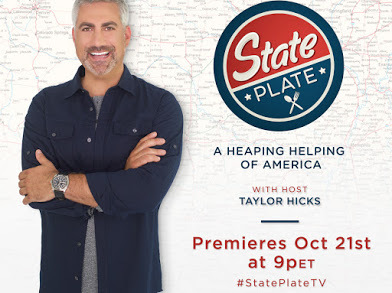 Family-entertainment network INSP has a new original series called State Plate premiering on Friday, October 21st at 9:00PM ET. The show’s host is Taylor Hicks, the platinum-selling artist and popular American Idol® winner. In each episode he’ll take a “culinary tour” of one state, assembling a plate of their most emblematic foods. The states featured include Wisconsin, Arizona, Florida, Louisiana, Georgia, Colorado, Illinois, Maine, Texas, Massachusetts, Nebraska, and California. This entry was posted in Portland, ME food on October 4, 2016 by peterpeterportlandeater.